The MEWP market is up right now, with rental companies refreshing fleets and construction work remaining robust. The Mobile Elevating Work Platform (MEWP) market is healthy and growing, and many of the latest changes manufacturers are making in the category are dedicated to elevating safety. “The market for booms was relatively flat throughout 2015 to 2017 and saw significant growth throughout 2018 in North America,” says Corey Connolly, product manager for Skyjack. “We’re expecting 2019 to be similar to 2018 with continued strong demand from both residential and commercial projects. Demand outside of North America will likely also remain consistent with 2018. Changes in the political climate and trade conflicts will continue to provide a cloud of uncertainty that could significantly affect demand. “In North America, demand from rental companies for adding or replacing their fleet will also be affected by the entry of machines to the market that are complaint to the recently published ANSI and CSA standards,” Connolly says. Platform safety features have been increasing in preparation for the new ANSI A92 standards, which include a provision for platform load sensing. Chad Hislop, Genie senior director of product management, Terex AWP, agrees on aerial industry growth, and highlights a number of factors impacting the market for the better. “Positive demand all starts with the fundamentals: time utilization, rental rates, fleet age, and the health of the used equipment market,” Hislop says. “Right now, these fundamentals are all healthy, and we’re expecting them to stay healthy in 2019. Also, the replacement cycle trough is waning and will now become a tailwind for demand as rental companies begin to replace units they purchased seven to 10 years ago. “Other factors could be a strengthening single-family residential recovery that could stimulate additional nonresidential construction beyond 2019—single-family starts are still well below average, particularly on a per capita basis, and nonresidential follows residential growth 12 months out,” Hislop says. Connolly hones in on power and boom choices. Sover says ease of operation, maintenance, and troubleshooting are important buying considerations. Many of the OEM’s latest MEWP innovations have come in the safety category as a result of latest ANSI standards. “The biggest change in the industry comes with the publishing of the new A92 ANSI standards,” Sover says. “Part of the new ANSI standard requires the manufacturer to incorporate design changes into the machine.Design changes will include active platform load-sensing, new wind force requirements, new stability test, required entrance gates with toe boards, new tilt-sensing requirements, machine markings and manuals, and solid or foam-filled tires. “When Manitou launched its MEWPs product line into North America last year, all machines were already designed to be in compliance with the new standard,” Sover says. Hislop points to specific safety features designed to promote operator awareness while on the platform. At The Rental Show, JLG featured its Enhanced Detection System (EDS) technology. EDS is an evolution of the company’s Soft Touch System, which uses proximity switches to stop a machine when it makes contact with an object or structure. EDS employs ultrasonic technology to sense when an object is nearby—first slowing, then stopping, the machine before it makes contact. When the machine is in use, strategically placed object-detection sensors establish warning zones and stop distances in the machine’s direction of motion. Both visual and audio alerts inform the operator when the boom or scissor lift approaches a structure. The user has the option to override the system to inch closer to the adjacent structure when required to complete the work at height. 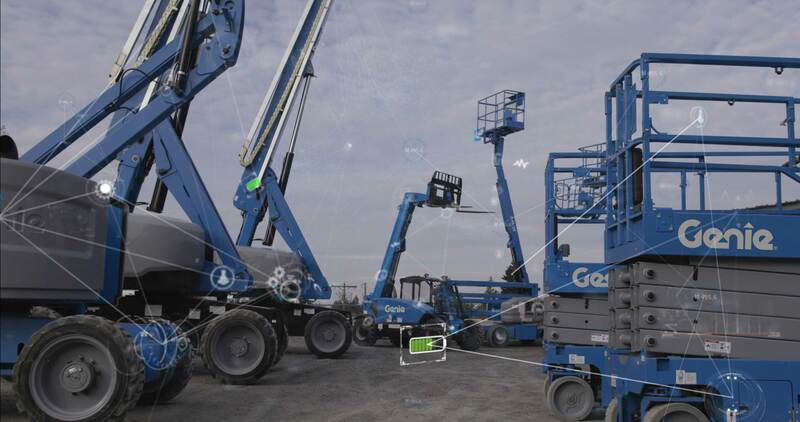 As seen with earthmoving equipment, MEWP makers are increasing their telematics offerings to benefit both their rental customers and end users. Telematics has proliferated enough that it can also influence a manager’s buying decision. Manufacturers are incorporating more telematics features into MEWPs, targeting both rental houses and end users who want help managing aerial fleets. The company also has apps within the solution’s digital product suite that are designed to give service technicians the ability to check in on the machine’s health from their smartphones. “Items that previously meant an on-site visit for many rental companies are now being resolved with a few keystrokes,” Connolly says. “Manitou’s Easy Manager is now a standard feature on the majority of our product lines,” Sover says. It is a web portal and mobile app that gives the owner actionable data at their fingertips to help with the day-to-day management of their operations. “This feature makes it easy for the owner to complete preventative maintenance, improve machine security, increase uptime, and provide better customer service, all of which allows the customer to concentrate on their core business and lets the owner or rental company manage the life cycle of each machine,” Sover says. “Over the last couple of years, we have seen the global adoption of telematics in the aerial industry,” Genie’s Hislop says. “No matter what size of aerial equipment fleet you have—from 100 to 100,000 machines—equipment management is something our customers do every day. Machine data can provide a lot of insight to our customers’ businesses, from knowing how equipment is performing to how often a piece is utilized. Or, where each unit is and when it’s ready for maintenance. Hislop says the telematics capabilities in MEWPs will undergo changes as it matures. “In general, we have seen rental companies use hours and location to drive utilization metrics, which is a great start, but access equipment is a bit unique in terms of ‘true’ utilization,” he says.